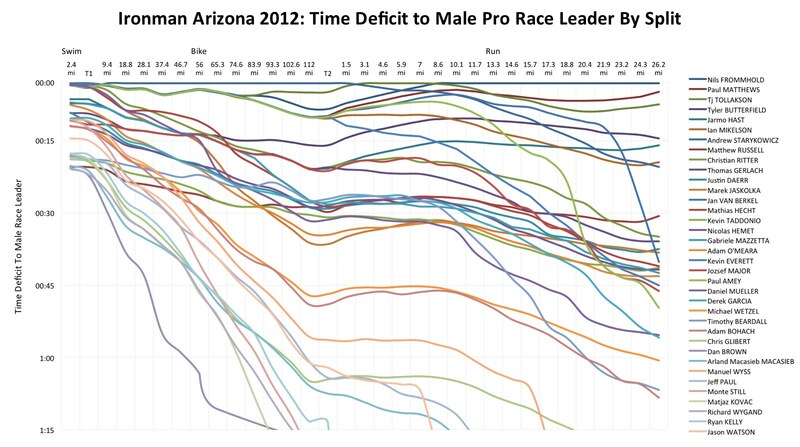 Twenty minutes after the finish of Ironman Arizona 2012 I had a full set of results and splits open in Excel and uploaded to my Google Drive. My scripts and tools have been significantly refined in the last few weeks and the process of retrieving results is relatively trivial although I remain entirely dependent on the quality of data in the Athlete Tracker. 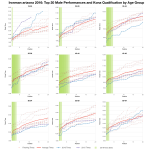 While there are a few obvious corrections to be made – I don’t believe anyone ran a 1:27 marathon – the data appears to be sound enough for a quick overview and a look at the professional race. Of course I started by adding another finisher distribution chart to my growing list. It’s an unremarkable Ironman distribution, quite an even and broad spread of results which seems typical of the majority of US races. More interestingly I can compare this with my charts from the 2011 running of the race and see how this year compares. There are definitely similarities in appearance, although it has to be noted that the 2011 event seems to have had a slower bike followed by a fractionally faster run. Perhaps conditions were a little easier this year or perhaps the field consisted of stronger bikers – I can only speculate. Ultimately we don’t see a huge change in typical finish times. As my 2011 and 2012 comparison so far suggests there doesn’t seem to be a huge change in the performances we see at each race venue, just small shifts with conditions. When I last checked in to the Athlete Tracker on Sunday evening Andrew Starykowicz was leading the race into T2, but unlike Florida a few weeks before he had company not far behind; I wondered if he’d have the legs to hold on to the finish a second time. As the chart below shows, this time he didn’t, he ran a similar 3:10 to Florida, not enough to hold on to first. Otherwise we see the usual mess – a small group of pros vying for the podium from start to finish with the rest falling back as the race goes on, some more significantly than others. Many lose a lot of ground on the bike, if not then the 10 mile mark on the run seems to be the point where more races come apart. The women were far more orderly. Greater divergence in swim performances, but more consistent in bike and run across the field. Most are slowing relative to the leader, but they do so over the course of the entire race, few seem to really hit the wall. 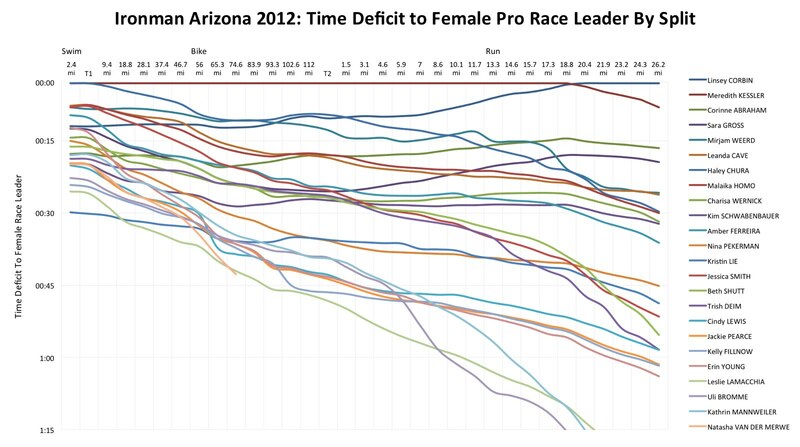 More conservative pacing by the female pros? 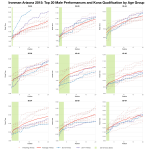 You can download a complete set of the Ironman Arizona 2012 results and splits from my Google Drive. I will be refreshing the data in a few days time to check that any obvious glitches have been fixed. 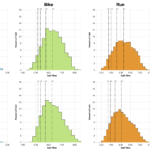 And if anyone finds a list of Kona qualifiers I’d be keen to add that data to the mix too.